Figure 1. Features of karst landscapes. (1) phreatic zone; (2) sink hole or doline; (3) polje; (4) vadose region; (5) swallow holes; (6) vauclusian spring; (7) limestone pavement; (8) kamenitza. Figure 2. Limestone pavement, featuring clints and grikes, above Malham Cove, Yorkshire. Figure 3. 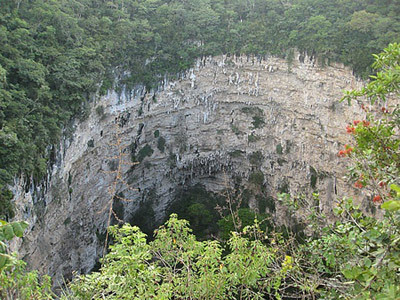 Sink hole, Tuxtla Guttierez, Mexico. Karst is a limestone topography (named after the Karst region of Slovenia), which typically includes irregular protuberant rocks, collapsed caverns, sink holes where streams disappear underground, and areas of bare limestone pavement (see Figure 1). This type of landscape forms where solution weathering wears away much of the limestone, and where rivers erode the rock. Most rivers are underground, and there are caves and large caverns. The largest caverns may collapse to form gorges, and gradually the entire area of limestone may be worn away. 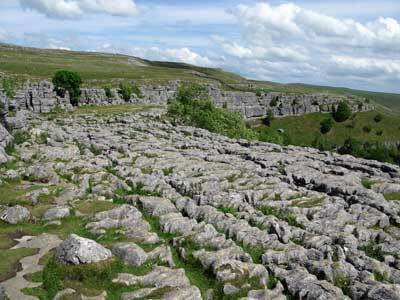 A limestone pavement (see Figure 2) is a bare limestone rock surface composed of slabs of rock, known as clints, separated by variable-width vertical cracks, known as grikes. Clint is a flat block of pavement, typically 1–2 meters (3–7 feet) across, separated from other clints by grikes that have developed by weathering and enhanced solution along joints. A sink hole (see Figure 3), also known as a doline, is a well or funnel-shaped hole, typical of karst landscapes, formed when groundwater dissolves an underground cavity in limestone, followed by slump of the surface.